In my never ending search for ways to help modular home builders survive the housing crunch I continually read success stories about builders throughout the US. Here is one that I have to share and even though it's about a site builder, the story could just as easily been about a modular home builder. When the economy turned sour, homebuilder Jay Grant found himself in a Catch-22. Since he wasn’t building new homes, he wasn’t getting the exposure that came from lawn signs advertising his work. How would people find him for smaller projects like renovations or remodeling? That’s when he had an idea. The best part about working from a home office was the welcoming environment it offered clients. But he needed a more visible space. So Grant opened One Main Street, a retail space at a busy corner in downtown Mendham that showcases his work plus that of his subcontractors, and serves as a meeting and event space. 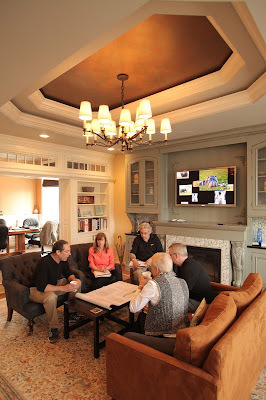 Jay Grant, and Lauren K. Gluck of Grant Homes and Doug Manfredo of Pella Windows work with clients Kevin and Michele Judge of Chapel Hill, N.C., in the Grant Homes showroom in Mendham. Aaron Houston/For The Star-Ledge. "When I’m selling from a home office, it’s a handicap," Grant said at the store on a recent afternoon, pointing to the fact his dog, Angel, could sometimes interrupt meetings. Plus, having a separate space makes it feel more professional. "Here, they see I’m committed to being here longer and staying in the business," he said. Small homebuilders like Grant have had to figure out new ways of doing business in this economy. Construction continues to struggle, and in March the U.S. Commerce Department reported housing starts for single-family homes at a rate of 462,000. But that is a fraction of the 1.8 million homes that were being built at the height of the bubble in January 2006. Nationwide, about 75 percent of homes are built by companies that construct fewer than 15 homes, according to the National Association of Home Builders. Fifteen years ago, big builders like Red Bank-based K. Hovnanian or Toll Brothers made up 10 percent of the market and small builders had 90 percent, but that changed by 2005, when the bigger companies’ presence increased to nearly 30 percent. Then, business stopped for everyone. "Survivability and diversification — those are the driving factors for a lot of builders," said Stephen Melman, an economist with the association who called small builders "the last bastion of entrepreneurs." "They’re going to figure out a way to do something," he said. "If they can get a job painting, they’ll do that. If they do remodeling, they do that. If things get better, they’ll figure out how to build a new home, and then they go back again." In December, building permits in New Jersey were authorized on more than 1,300 new homes by the Department of Community Affairs, which is the highest level of production in 40 months, according to the most recently available state figures. But much of the new housing was apartment buildings in areas like Hackensack and Jersey City. One area that has picked up is from homeowners who choose to redo their kitchens or bathrooms. But it can take many projects at that scale to compensate for how much income would come from building a full house. And people want the best price, and they’re not afraid to say so, builders said. "Now would be the time to say you want to keep your bills paid and you want to stay in business," said Bill Scopetto of Genesis Home Builders in Raritan. "You basically are keeping afloat _ you’re more concerned about just staying in business until it starts to pick back up. I wouldn’t look at it as 50 kitchens are equivalent to a home sale profit." Scopetto said he and his brother are doing a lot more business, but cumulatively it is only one-third the amount they used to make on a yearly basis. And, that work is considerably more competitive now. "All the builders are in this renovation business now, so you’re competing with a whole bunch more people," Scopetto said. "You’ve added all the single-family homebuilders in addition to the people who already existed." Some builders are taking more classes and educating themselves about environmentally friendly building strategies, said Dominick Paragano, immediate past president of the New Jersey Builders Association. Others have turned to commercial work to transform spaces for retailers or design offices when companies relocate. "We work harder now to make less money, essentially," said Paragano, who runs D.L. Paragano Homes in Metuchen. "Builders have to be more innovative — they have to be better at what they do (and) put out more proposals, more jobs. It’s like everybody else in the market — they’re working harder to make the same dollar." That said, Paragano said he misses building actual homes. "I can’t wait to get back — I miss getting on the project in the morning," Paragano said. "I’m the guy that grew up with dirt on my hands, and, you know, I really want to start getting back into the single family home construction. I just can’t wait." The downturn may have brought one silver lining to the industry, however: only the smartest builders have survived, Grant said. "If you’re still standing, you’ve done something right to be still be standing — a lot of the chaff has been removed, and those that are doing stuff have to have their act together," said Grant, who started building homes 25 years ago. "Other builders are getting more aggressive minded," he added. "Risk/reward is what makes us businessmen, and we’re going to have to take a risk."